Supporting act Khruangbin warmed up the crowd with their infectious Middle Eastern and psychedelic musical blends. Bass player Laura Lee grabbed the audience’s attention from the get go with her seductive vocals and hypnotic stage movements while guitarist Mark Speer and drummer Donald Ray “DJ” Johnson Jr. fueled the rhythm. The band is currently on tour in support of their second album, Con Todo El Mundo. “Tonight let’s groove out! Don’t be scared to dance!” Bridges exclaimed as he busted a few smooth moves before serenading right into “Bad Bad News” off his newest release, Good Thing. The talented retro- soul singer had the adoring crowd within the palm of his hand as he performed beautiful ballads such as “Brown Skin Girl” and his trademark hit, “Coming Home.” Throughout the entire evening fans swayed back and forth bellowing out the lyrics with as much passion as Bridges himself. As Bridges exited the stage, the audience roared for “one more song!” Luckily their wish was granted and then some. Bridges and his band returned for not one, but two more songs! The first encore was a beautiful rendition of “River” featuring Brides on an acoustic guitar with his backup singers. Cell phone flashlights lit up the theatre like a swarm of fireflies in the night. Bridges had one more surprise left for his fans. John Mayer returned onstage to close out the evening with “Mississippi Kisses.” Mayer wailed on his guitar as Bridges collapsed on his knees, howling out into the night sky. Mayer’s extended guitar solo carried on even as fans headed out of the theatre. Leon Bridges’ stage presence and ability to draw in a crowd, through his lyrical and narrative performance is unlike any that I have seen. If you are into a lively show that gets you up on your feet, singing your heart out, and overall leaving you wanting just one more song this is the tour for you. Static and Surrender. Photo by Jessica Klausing. Bay area rockers Static and Surrender are on tour throughout California in honor of their debut album release. Their energetic riffs and rhythms are on par with the alternative superstar acts such as Lifehouse and Matchbox Twenty. 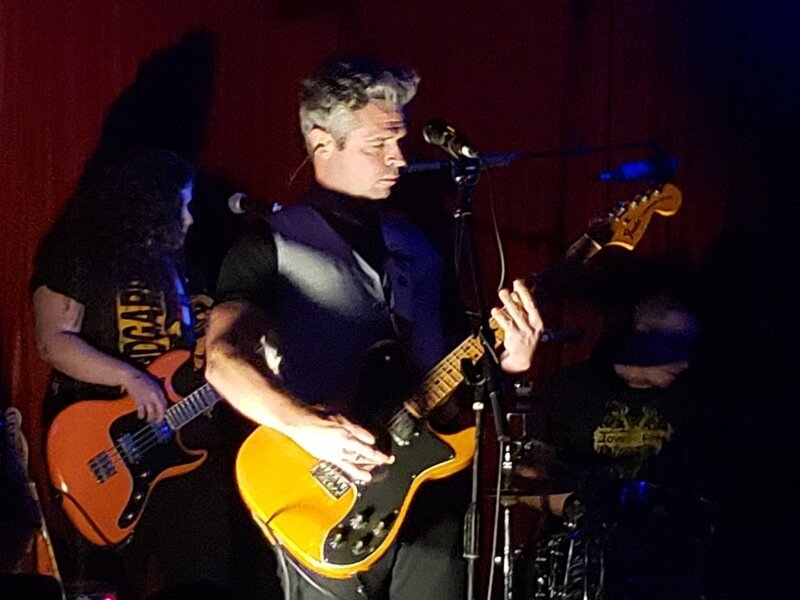 Jeff Campbell (lead vocals, guitar) backed by John Schuman (drums), Adam Schuman (guitar, vocals), and Lauren Stockner (bass player) – all stars in their own right – delivered a passionate performance at Hollywood’s Hotel Café. Jeff Campbell puts his heart and soul into each song and it shows. He kept the set running smoothly and without interruption for the majority of the night. Opening up with “Killing The Vibe” Campbell belts a powerful vocal delivery that commands the attention in a room while his bandmates exerted lighting-in-a-bottle energy around the small stage with ease. With such a strong reaction from the crowd, the level of energy and intensity only grew with each song. The next song, “If Only We Could Sleep” was no exception. John Schuman pounded the drums as if his very life depended on it! His intensity was so great, that at one point, he had accidentally knocked over his microphone stand. “Just Because” followed with a stripped down funky rhythm courtesy of Adam Schuman and Lauren Stockner. Campbell explained that the song is about society’s expectations for us to find love, marry, and procreate. Ending with “The Very Long Night,” Static and Surrender put on an electrifying performance overall.